(Associated Press) STOCKHOLM – New evidence from Russian archives suggests Swedish diplomat Raoul Wallenberg, credited with rescuing tens of thousands of Hungarian Jews during the Holocaust, was alive after Soviets reported that he had died in a Moscow prison, a Swedish magazine and U.S. researchers reported Thursday. 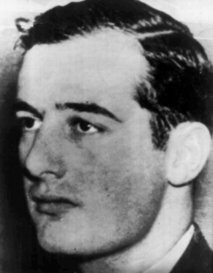 World War II hero Raoul Wallenberg is seen in this undated file photo. The fate of Wallenberg, who was arrested in Budapest in January 1945 by the Soviet army, has remained one of the great mysteries of World War II. The Soviets claimed he was executed July 17, 1947 but never produced a reliable death certificate or his remains. Witnesses claim he was seen in Soviet prisons or labor camps many years later, although those accounts were never verified. Now, the archives of the Russian Security Services say a man identified only as Prisoner No. 7, who was interrogated six days after the diplomat’s reported death, was “with great likelihood” Wallenberg. The security services reported the find last November to Susanne Berger and Vadim Birstein, two members of a research team that conducted a 10-year investigation into Wallenberg’s disappearance in the 1990s. The researchers informed Wallenberg’s relatives in a letter released for publication Thursday. The findings also were reported in the Swedish magazine Fokus. As Sweden’s envoy in Budapest from July 1944, Wallenberg prevented the deportation of 20,000 Jews destined for Nazi concentration camps or death factories. He also dissuaded German officers occupying the Hungarian capital from a plan to obliterate the city’s Jewish ghetto, averting a massacre of its 70,000 residents. “Everything we believed earlier (about Wallenberg’s death) is turned upside down by this,” he told The Associated Press. Wallenberg’s stand against the Nazi occupation forces, his disappearance and the purported “sightings” in the Soviet gulag have made him a folk hero and the subject of dozens of books and documentaries. Log in | Register |	90 queries. 0.638 seconds.